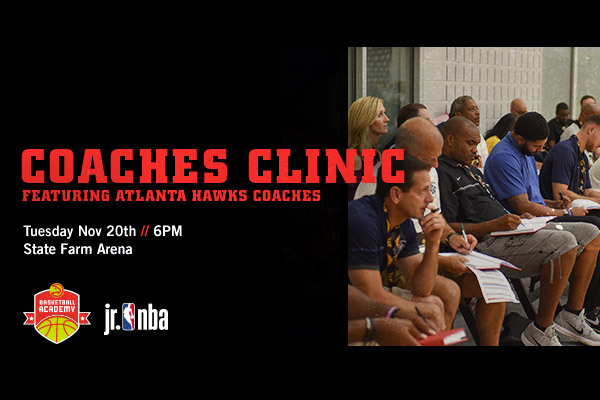 Join the Atlanta Hawks Basketball Academy for a FREE Coaches Clinic on Tuesday, November 20th at the all-new State Farm Arena from 6:00pm-8:30pm. Learn from Atlanta Hawks Coaches and other professionals in the industry. Basketball coaches of all levels are invited to attend. Light food and beverage will be provided during check-in and networking hour from 5:00pm-6:00pm. Attendees will receive Atlanta Hawks gear. All attendees will have the opportunity to win premium prizes and autographed items provided by Emory Healthcare. Feel free to share this invite with your coaching network. RSVP is required. Click here to sign up.